Cut and untwist a 20″ piece of Natural paper twist. Fold the piece, end to end, to find the middle. Twist the piece one time in the middle (this helps the piece over the top of the styrofoam ball). Form the paper, covering the entire ball. Secure the paper with a piece of floral wire at the neck. Do not trim excess! Cut and untwist two pieces of Natural, each 12″ long. Place one piece on top of the other, cut the pieces lengthwise into 1/2″ strips. Keeping the strips in a bundle, secure them together with floral wire 1″ from each end to form the wrists. Place the arms between the two pieces extending from the neck and secure with floral wire. Cut and untwist four pieces of Natural, each 20″ long. Drape two pieces evenly over each shoulder. Criss cross the pieces about 2″ down and secure with floral wire to form the waist. Below the waist, from the bottom up, slit the four pieces several times (about 5″ up) to create fringe. This fringe will become the legs of your scarecrow. Cut and untwist two pieces of Hunter Green, each 6-1/2″ long. Place one piece on top of the other and glue the side or lengthwise edges together. Cut a 4″ slit up the middle of both pieces. 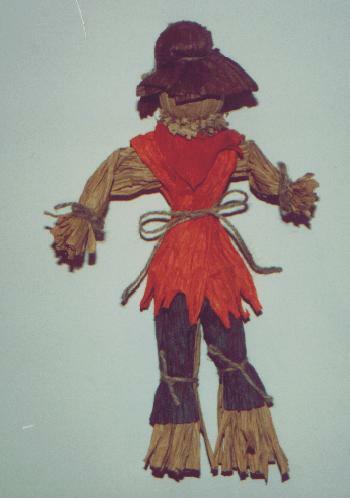 Slip the pants onto the scarecrow’s legs to the waist. Secure the pants at the waist with a piece of just. Separate the legs evenly. At knee level secure the bottom of the pants to each leg with a piece of jute. Cut and untwist two pieces of Orange, each 12″ long. Drape one piece over each shoulder and cerise cross at the waist. Secure the shirt at the waist with a piece of just. Cut fringe along the bottom of the shirt. Cut and untwist two pieces of Chocolate Brown, each 8″ long. Side by side, glue the two pieces together lengthwise, to double the width. Fold this piece in half and stuff a small amount of cotton or poly-fil in the middle of the fold. Secure the stuffing inside the fold (around and under the stuffing) with just. Spread and flatten out the paper below the just to form the brim of the hat. Secure to the scarecrows head with glue. Untwist the 2″ piece of Red. Cut a triangle out of the red piece, large enough to fit under the neck. Secure the scarf to the shirt with glue.